What do you do with the clothing when someone you love passes away? Everyone handles this question differently. Some people hang onto everything, others may want to donate to Goodwill or other local charities. When my dad passed early one December morning, my Mom came home from the hospital and started clearing his closet. She gathered everything up and sent us to donate his clothing to the local men's Mission. (I did manage to grab a few things like the gray wool jacket that I always remembered him wearing while growing up). While to me, this seemed a little extreme at the time, everyone handles loss in a different way. Many of my customers tell me that they have kept the closet filled with the clothing for years. They often go to the closet and pull the clothing around their shoulders and try to breathe in the essence of the loved one. Smell is a strong trigger, and it is normal to try to hang on to that. Maybe it is your mom who always had a stain on her shirt, or the rip in dad's jeans pocket, or the paint spots that splattered when doing the big remodel project. Whatever it is that brings up fond memories should be saved and treasured. When the time comes that you are finally ready to clear the closet, you might be unsure as to what do with those clothes. 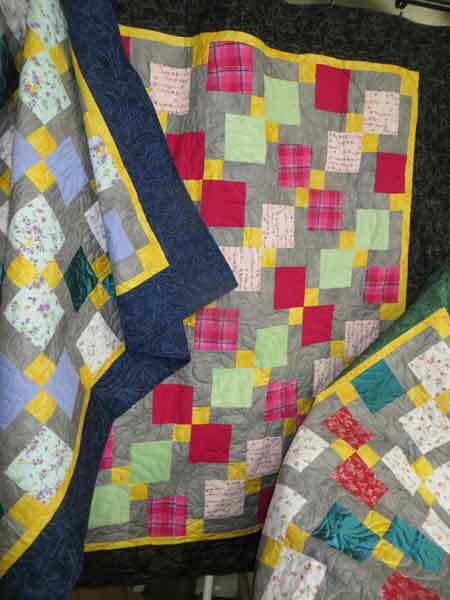 A memory or bereavement quilt is a great way to make one - or more - quilts with the clothing. With as few as 5 or 6 items of clothing, we can make a beautiful remembrance. The quilts pictured to the left are three quilts made from blouses, nightgowns and slacks. Shirts, Polos, blouses, t-shirts and other tops. Tech clothing- biking, running etc. Our rule of thumb, is that "If it can be laundered, we can use it". If using an item such as silk and linen that might never have been laundered, it is a good idea to throw in the wash. When laundering your quilts in the future, fabrics might distort in shape, or the colors 'run'. By taking a little pre-emptive checking we can avoid that. We want to make a quilt that you and your loved ones who use and treasure for generations. Whatever the reason you are considering a Memory quilt, whether it is for the loss of a loved one, or your childs baby clothes. Whether you are ready now, or think it is going to take just a bit more time. Just DON'T THROW AWAY THAT CLOTHING! For more information about how to get started, just click the link below. 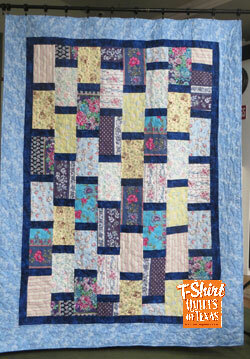 T-Shirt Quilts of Texas/Shadywood Quilts have been in business for over 15 years. Let us help you turn that pile of clothing into a memory that will last for generations.